French lentils are not especially farinaceous and should be cooked just till tender. If overcooked, they lose their shape and become mush. 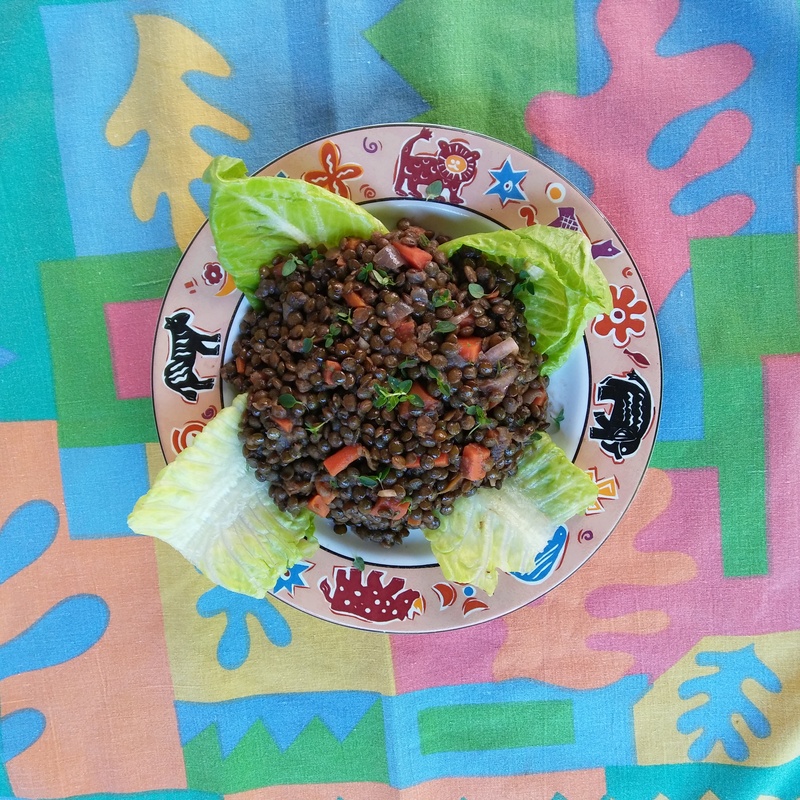 I always make a large quantity of this lentil salad–first served warm and then later refrigerated and brought to room temperature. It makes almost two different salads for the same time to prep. Lentils can be kept safely under refrigeration for five days. Once a rarity, French green lentils are getting easier to find and come under the name of French (green) lentils or Du Puy, which refer to the French region Puy de Dome where the authentic French lentils are supposed to have originated. I also give a quick version of this recipe at the end that sacrifices some of the flavors for a shorter process that is quite remarkable, especially if you intend to serve this salad warm as an accompaniment to a main course or mixed with fresh grape tomatoes, which makes a very healthy fare. Lentils along with beans are rich in dietary fiber and have been promoted as an important part of a balanced diet (half a cup of cooked lentils alone provides most of your daily amount of folacin and lentils are rich in iron and magnesium). Sauté red onion till soft and translucent in pan large enough to hold lentils and broth. Add garlic. A bit after adding the garlic, add the broth, the spices, the dried herbs, and then lentils. Let this all cook slowly till tender (45 minutes/ 1 hour). When ready add fresh thyme. In the meantime, wash the carrots. Slice them on the bias ¼ inch, spread in a pan and merely cover with some veggie stock or water. When halfway cooked, drizzle some honey over carrots and continue to cook until they are tender but still firm. Put carrots aside. Drain lentils and pour liquid from cooking into hot pan used to cook carrots. Reduce heat until paste forms. In pan, mix together carrots, lentils, and thinly sliced shallots. Whisk oil with paste and pour over lentil mixture. Let cool and adjust taste. Eat cold or slightly warm. You may serve lentils salads in a bowl with some fresh thyme on top, or cupped into green leaves for presentation. Lightly sauté garlic, add onions and cook until translucent. Add shallots and vinegar—cook a little bit further until shallots are full cooked. Add liquid if needed. Add fresh thyme.